Try this warming dish, a perfect dinner for cooling autumn evenings! Swordfish is one of our most popular grilling fishes, but it's also delicious broiled, baked, or sautéed. Check out this recipe from Simply Recipes for a warming swordfish meal. 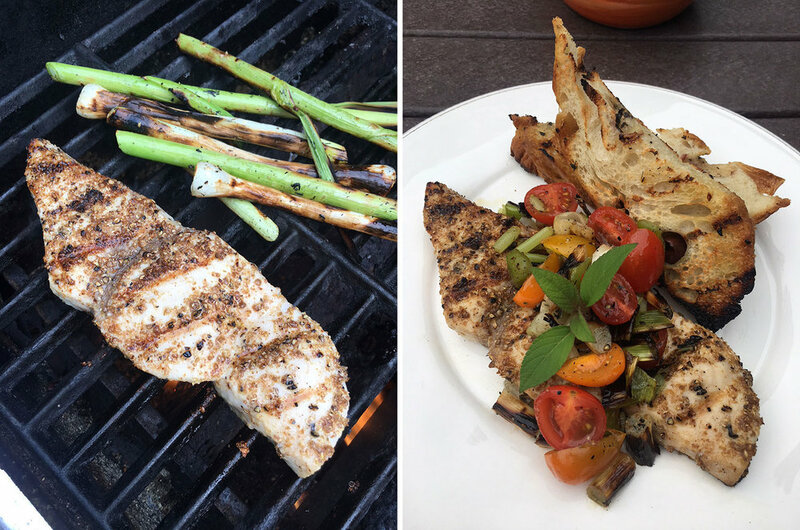 Our friend Kathy Cavanaugh shares a family recipe for grilled swordfish. Our fresh, local Swordfish is moist and flavorful with a slightly sweet taste. Steaks have a moderately high oil content and a firm, meaty texture. Swordfish is traditionally served baked with a slice of lemon. It's also excellent for marinating and grilling. For moist grilled swordfish, select steaks that are at least 1 1/4 inches thick. Baste with olive oil and lemon juice before and during cooking. Check out this recipe from Simply Recipes. This recipe is from our very own Mike Grattan! Say hi to Mike and pick his brain for more recipes at the Aquidneck market.